What are the Dietary Guidelines for Americans (DGA) and MyPlate? The Dietary Guidelines for Americans are issued and updated every 5 years by the Department of Agriculture (USDA) and the Department of Health and Human Services (HHS). The purpose of the guidelines is to provide advice for Americans about making informed food choices and being physically active to attain and maintain a healthy weight, reduce risk of chronic disease, and promote overall health. 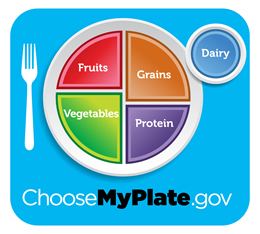 MyPlate goes along with the Dietary Guidelines and replaced the food guide pyramid (MyPyramid) as the new symbol for healthful eating in the United States. MyPlate illustrates what portions of the different food groups can look like divided out on a plate in order to be representative of a balanced diet. From the Myplate website, "MyPlate illustrates the five food groups that are the building blocks for a healthy diet using a familiar image-a place setting for a meal. Before you eat, think about what goes on your plate or in your cup or bowl." The Dietary Guidelines and MyPlate emphasize the importance of eating a variety from the different food groups each day, but keep in mind that the most recent dietary guidelines have a strong focus on reducing overweight, obesity, and chronic disease. It is best to read and use this information as a general guideline and tool to reflect on current behaviors related to nutrition and physical activity, while taking into account your individual needs. Honoring your health with nutrition is important, but if a positive relationship with food is not in place, it can be difficult to truly pursue healthy eating. If food is a source of stress or struggle, or if you are focused on nutrition for the sole purpose of weight loss, it may be a good idea to first review the section on positive eating attitudes and behaviors, or visit our webpage on eating concerns before reading through the dietary guidelines. While the idea of stabilizing a healthy weight and striving for a nutritionally adequate diet are endorsable goals of the Dietary Guidelines for Americans (DGA) and Myplate, some critics question the guidelines use of a "control model" (using rules to tell people what and how much to eat) to improve health. This comes at the risk of overlooking the importance of a more inclusive message focused on trusting and supporting positive eating attitudes and behaviors. Ellyn Satter is a registered dietitian, family therapist, and an internationally recognized authority on eating attitudes and feeding behaviors. While Satter endorses the DGA goals related to managing a healthy weight and nutritionally adequate diet, in a February 2011 newsletter, she voices her concern over the methods that are suggested to achieve these goals by stating "[The Dietary Guidelines for Americans] 2010 repeats earlier ineffective and even harmful prescriptions...telling people what and how much to eat...when the joy goes out of eating, nutrition suffers." Of great concern is the possibility that the DGA may promote a higher degree of conflict around eating, physical activity, and body image for some people. Disordered eating and compulsive exercise are serious issues for both women and men on many college campuses and for society in general. Many college-age women, in particular, have inadequate intakes of calcium, iron, and other important nutrients, often as a result of trying to limit the caloric intake of their diets. It is important to be informed of the DGA and Myplate as informative tools, but consider placing a stronger emphasize on a personalized approach that reinforces honoring hunger and fullness, enjoyment of foods, and self-confidence where health decisions related to food and weight are concerned. For more detailed information about these concepts visit our weight concerns webpage. It is important to acknowledge the benefits of maintaining an appropriate weight, but at the same time we need to recognize the potential problematic aspects of weight control (which the 2010 Dietary Guidelines do not address) such as weight cycling from dieting. Interestingly, a California study compared changes in weight, labwork, eating behavior, eating attitudes, and psychology (self-esteem, depression, body image) between two groups of women receiving 6 months of weekly group education. The first group received behavior-based weight loss education which included nutrition information, moderate calorie and fat restriction, keeping a food diary, and monitoring weight. The second group used a Health At Every Size (HAES ) approach which focused on body acceptance, nutrition education, decreasing restrictive eating, increasing attention to internal cues for hunger and satiety, and addressing barriers to enjoyable physical activity. The results were striking. At the two-year follow-up point, the HAES group showed sustained and significant improvements in total cholesterol, LDL, blood pressure, moderate physical activity, restricted eating, susceptibility to hunger, body dissatisfaction, and self-esteem. The diet group did not sustain positive changes in any of these areas, in fact, self-esteem was shown to be significantly worse at the two-year follow-up point. Fifty-three per cent of the diet participants expressed feelings of failure, compared with 0% of the HAES group. It is important to remember that weight, Body Mass Index (BMI) or body size alone does not determine the health or fitness of an individual. Rather addressing lifestyle factors (nutrition, sleep, stress, physical activity, medical conditions, etc.) in positive and rewarding ways proves to be a better predictor of long-term health. Physical activity becomes less enjoyable when it is used for the sole purpose of weight control, weight loss, or burning calories. Feeling extreme guilt when you are less active or trying to compensate for eating a certain type or amount of food by exercising more are signs of an unhealthy relationship with exercise. These negative attitudes can quickly reduce the positive benefits physical activity is able to provide. Enjoyment is a far better predictor and motivator of consistent physical activity than worry or guilt, and it brings along more health benefits. Focus on fun and enjoyment when you think about being active. Concentrate on the pleasure and satisfaction you get from moving your body to music, being in nature, participating in a team sport, or becoming more accomplished with an active hobby. The key is keeping activity fun and flexible! How can I make the Dietary Guidelines and Myplate work for me? Nutrition policy applies to populations, so depending on your individual eating behaviors, the guidelines may or may not apply to you. Trust yourself. When eating is a positive and reliable experience, people bring themselves along with respect to improving the nutritional quality of their diets. Be realistic. Make gradual, small changes over time in what you eat and in your level of exercise. Small steps work better than giant leaps! Be adventurous. Expand your tastes to enjoy a variety of foods. Be flexible. Look at what you eat and the physical activity you do over several days. There is no need to worry about what happens at every meal. Be sensible. Enjoy all foods; just don't overdo it. All things in moderation is the best approach to healthy eating. Be active. Taking a walk between classes, playing a game of Frisbee, and going dancing are easy ways to get exercise. Normal eating is going to the table hungry and eating until you are satisfied. It is being able to choose food you like and eat it and truly get enough of it - not just stopping because you think you should. Normal eating is giving yourself permission to eat sometimes because you are happy, sad or bored, or just because it feels good. Normal eating is three meals a day, or four or five, or it can be choosing to munch along the way. Normal eating is overeating at times and wishing you had more. Normal eating is trusting your body to make up for your mistakes in eating. Normal eating takes up some of your time and attention, but keeps its place as only one important area of your life. When reviewing the dietary guidelines, keep in mind the importance of trusting your natural hunger and fullness signals as a way to self-regulate energy balance and focus on eating a variety from all the food groups. This approach honors the body, meets nutrition needs, helps maintain an appropriate body weight and ultimately supports overall good health.